Are you getting ready for winter? 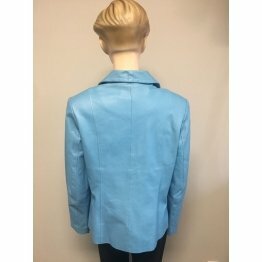 Do you like to pick up some leathers blazers? 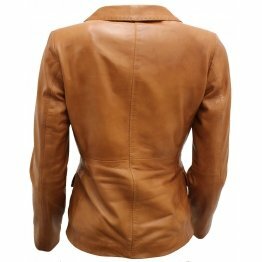 There is a stunning range of leather blazers for ladies in brown, black, white, red, tan and more. 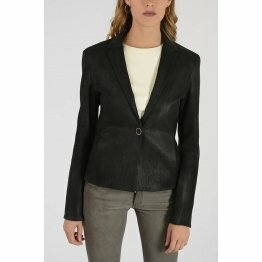 Choose your favorite style of leather blazer womens and add panache to your outfits. 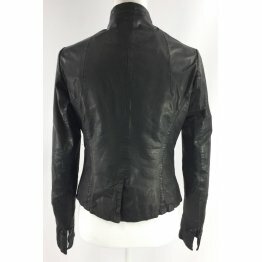 Shop online at ZippiLeather.com store and make your life free of hassles. 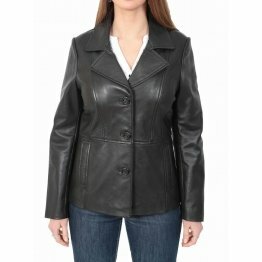 Pick up leather jackets from a sea of options of varying lengths and patterns and be a leader in fashions. Be trendy on your next road trip with a pair of black shorts with a printed off-white top teamed with a red blazer. 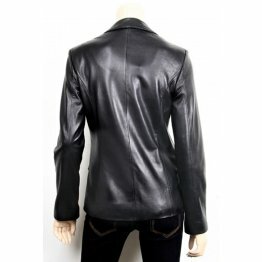 Add metallic details and a leather wrist band for a touch of androgyny to your fashions. 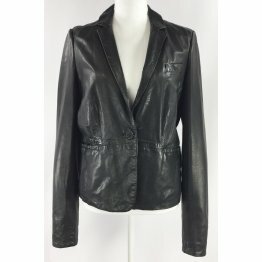 You can top leather blazer womens up with aviator glasses and sneakers. 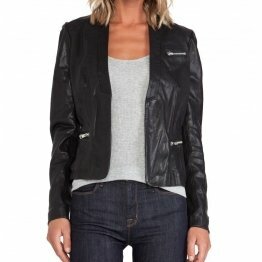 The jacket is designed with a asymmetrical-zip and features knit panels for cool contrast and comfort. 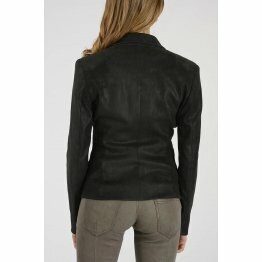 All jackets of this brand come with a slim fit and an attitude which is ageless. 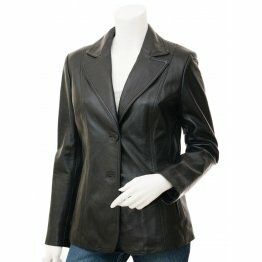 The jacket is built of genuine shell leather with knit panels which are 100% acrylic. 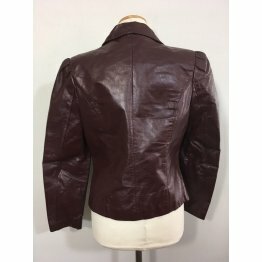 It has double lining one of which is 100% polyester while the other lining is 92% polyester with 8% spandex. The collar is fold over and converts to scuba collar when required. The underside of the sleeves has a stretchy knit. 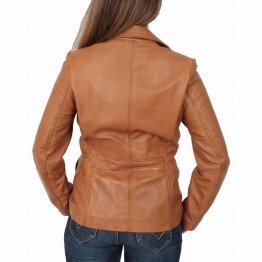 It has two hand pockets with zips to provide security to the contents in the pocket. 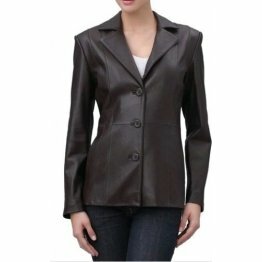 Leather blazer womens can only be cleaned by professional leather cleaner. 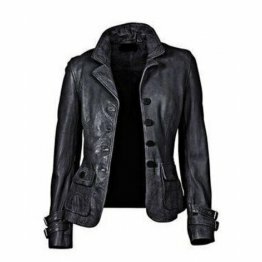 The outer part of the ladies biker jacket is made of faux-suede and has stretch for comfort. 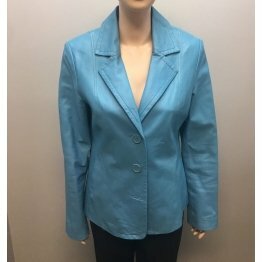 It is fully lined and has notch lapels. 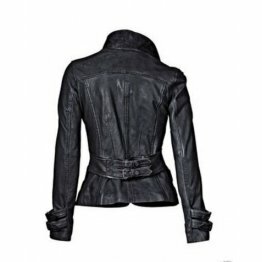 It has asymmetric zip fastening and functional pockets. 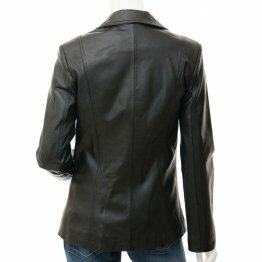 Womens motorcycle jacket of regular fit with 90% polyester and 10% elastane. 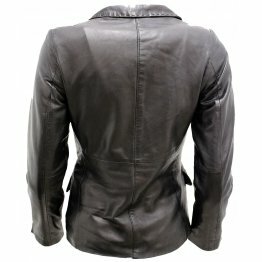 This jacket with fashion forward style teamed with skinny cut jeans is perfect for an evening out as well as a party. 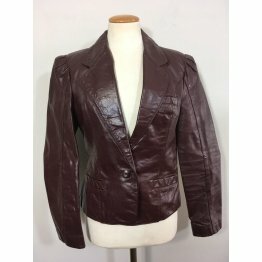 The jacket can also be teamed with shorts and riding boots for your evening ride on the motor bike and have heads turn your way. 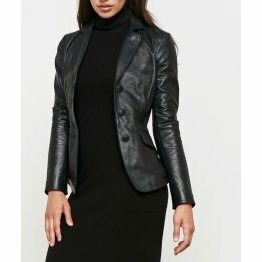 You can also don a silk jacket with a pencil skirt and white top while you head to watch a play. 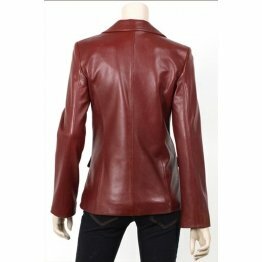 It is made of 100% polyurethane with lining of polyester. 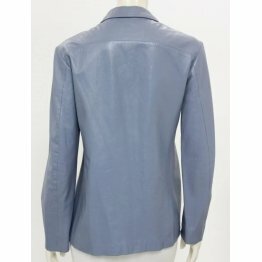 It is fully lined with exposed zipper details and is available in all colors including blue and grey. 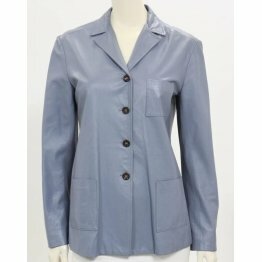 The sleeves are long and there are two pockets on the chest and two pockets on the side with zippers. If the weather is cool you can use the hood. 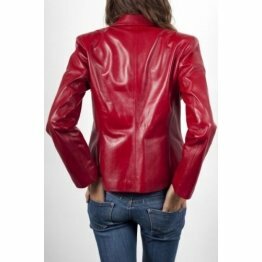 There is a wide collection of leather apparels for club wears, faux leather lingerie and celebrity fashion apparels. These products are authentic at affordable costs. 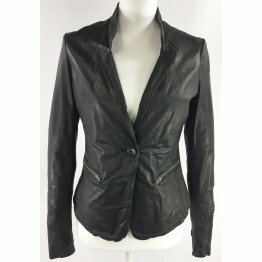 The faux leather jacket is perfect for a ride on the motorbike or for an evening out with friends. 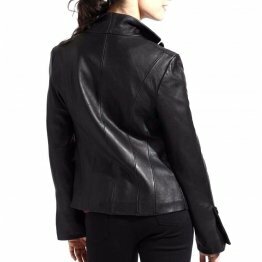 The Italian leather jacket is the softest jacket imaginable crafted from soft nappa lambskin leather with simplistic and clean lines. 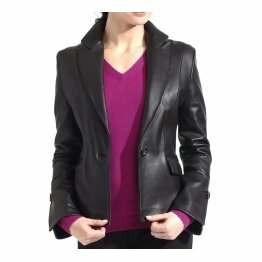 Lleather blazer womens provides a gorgeous looks that boasts femininity and class. 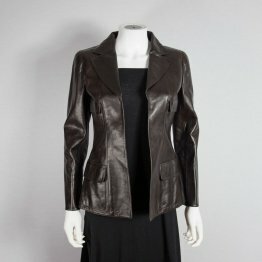 This jacket has a generous cut and can be used for any occasion. 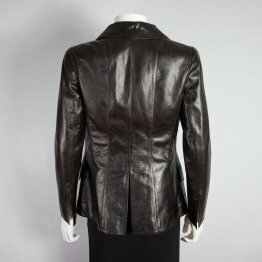 The lambskin that is used in the making of this jacket is given special treatment to make it softer than it is. 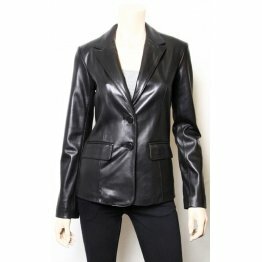 It has pretty designer lining, stand-up collar, side pockets and zip closures with gold hardware. It also has hand stitching. A survey will show you that young people like distressed denim jackets instead of leather jackets when going for their evening stroll. The appeal of a denim jacket is never lost but is enhanced with age. If you want to join the peers you can make a statement with embellished styles. 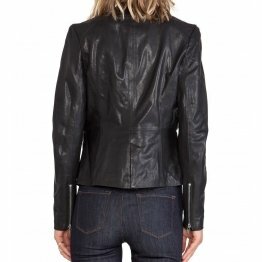 A denim jacket will help to give a chic look to casual outings.